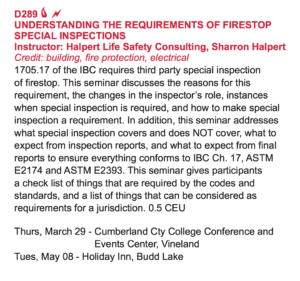 If you want to learn more about protecting commercial kitchen exhaust or the new requirements for AHJ’s with the need for firestop special inspection or when they are required we have some classes for you to consider. If you want information on other classes provided by DCA please see this brochure. 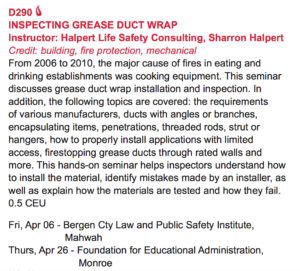 Sharron is excited to be teaching these two classes again this year. I know we will be talking about codes and standards but we actually manage to have a bit of fun.